Mark your calendars, this month there will be five weeks of “Evenings with Enrique” culminating in a special Dia de los Muertos celebration on the evening of Wednesday October 31 featuring an Alférez-inspired altar by artist Cynthia Ramirez. Every fall and spring, hundreds of visitors enjoy food, drinks, and live music amongst the beautiful grounds of The Helis Foundation Enrique Alférez Sculpture Garden. 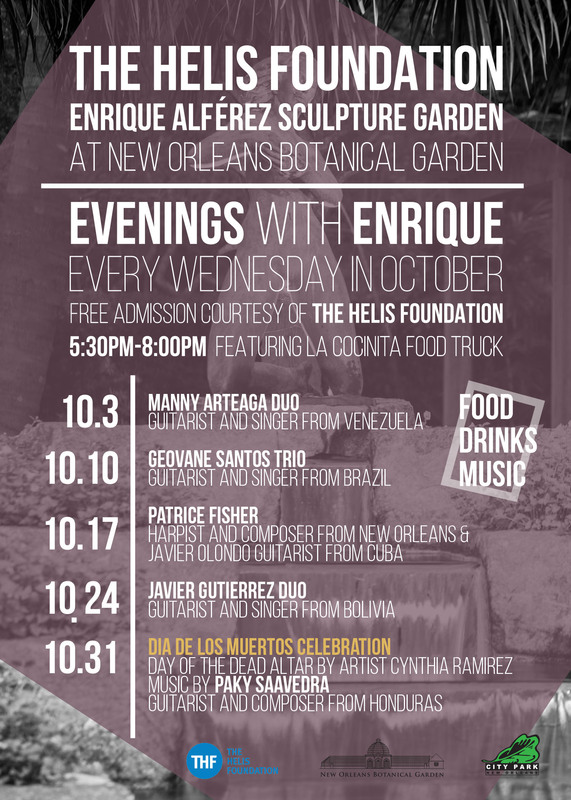 By popular demand, the New Orleans Botanical Garden has reprised the series and will extend its hours to 8 p.m. every Wednesday during the month of April beginning Wednesday, April 4, to celebrate “Evenings with Enrique.” Throughout the year, every Wednesday is free to Louisiana residents, courtesy of The Helis Foundation. Located inside New Orleans City Park, the New Orleans Botanical Garden is one of the few remaining examples of public garden design from the Works Progress Administration and showcases the Art Deco influences of three renowned talents of the era: architect Richard Koch, landscape architect William Wiedorn, and Mexican-American artist Enrique Alférez. In October 2015, the New Orleans Botanical Garden unveiled The Helis Foundation Enrique Alférez Sculpture Garden, an 8,000 sq. ft. park featuring sculptures by Enrique Alférez set within sweeping footpaths surrounded by lush tropical flowers and shrubs. Each Wednesday in October, “Evenings with Enrique” will feature local musicians playing among the collection. Learn about the life and work of Enrique Alférez under enhanced lighting and fire baskets suspended from the branches of the Live Oak tree. Guests are invited to purchase mojitos and Latin food provided by La Cocinita food truck. Can’t make it on October 31? The Helis Foundation will be supporting extended free admission to the New Orleans Botanical Garden Wednesday through Friday so visitors can experience the special Dia de los Muertos altar.